The GRASP Tool is a 10-minute grant readiness assessment questionnaire that will give you a specific measurement of your organization’s grant readiness. 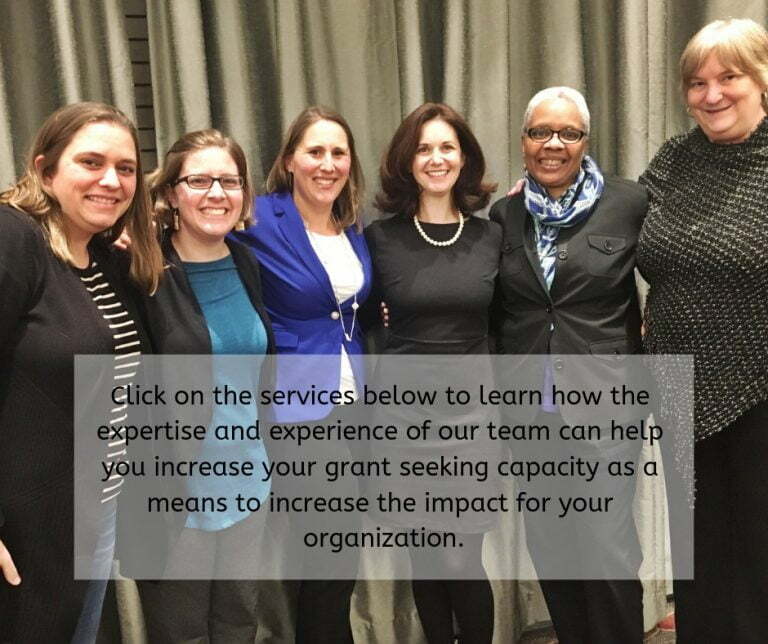 Let our research team help you develop and/or expand your grant calendar by doing your grantmaker research for you! Search for corporate, family, public, private and corporate grantmakers on the local, regional and national level. We use our in-house records, subscription-based databases including The Foundation Directory Online and GrantStation, as well as other sources in conducting the research. Review and assess your current grantmaker relationships to understand current funding relationships and opportunities pursued. Prepare a comprehensive report of potential funders that align with the client’s strategic plan and goals to grow grant revenue. The report will include due dates, appropriate request amounts, and application procedures/timelines for any funding sources identified. Present recommendations on funders to approach first and strategies for approaching prioritized funders. Present funding search materials in a user-friendly electronic format (typically Google Drive, but we are flexible based on your technology needs!) which can be used as an ongoing reference source when pursuing future funding. Work with the client to finalize your grant calendar for the next year. Finalize a plan for approaching the identified funders/applications and establishing timelines for applying to the identified funders/applications. Gather detailed information about your organization’s programs and activities. Work from existing logic models and program plan documents to develop grant proposals. Conduct research as needed in order to strengthen your grant proposal. Provide support and consultation for any special requirements of the funder. Write and tailor letter of inquiry and grant proposal(s) to each grantmaker’s specific requirements. Provide editing suggestions and proposal critiques to assist your staff in strengthening proposals and increasing chances for success. Our mission is to assist nonprofits in increasing their capacity to seek and manage grant funds in as a competitive manner as possible. To achieve this mission, our team of Grant Professionals Association Approved Trainers offer grant writing workshops and webinars to nonprofit organizations. Are small group or classroom-size workshops designed to enhance the grant writing skills of the participants. Provide participants with information about what foundations are looking for in proposals/programs. Provide participants with handouts and materials, including case studies. Instead of wondering how your proposal will fare against the review process, you can increase the competitiveness of your application by having your application go through a mock grant review prior to finalizing the application for submission. This process is a proven way to increase your competitiveness in state and federal grant applications. Convene team to review your completed grant application, prior to formal submission, following the scoring rubric of the grantmaker. Provide content edits and scoring feedback specific to the scoring rubric of the grantmaker. Provide a summary of edits and comments based on the scoring rubric of the grantmaker. Provide a second review of the completed grant application, if requested, prior to submission. If a member of our team was also the lead writer for the application being mock reviewed, the team assembled for the process will not include the lead grant consultant or supportive junior grant consultant who wrote or edited the application. Interested in learning more about how our customized services can assist you in meeting your grant seeking goals? "It is a great pleasure to recommend Diane and her exceptional team at DH Leonard Consulting. With her firm's assistance, North Carolina New Schools was successful in securing a $20 million i3 scale up grant from the U.S. Department of Education. This was an incredibly complex and challenging proposal; with their help, what seemed impossible became possible. Her expertise, strategic and thoughtful approaches, great communication, and flexibility were tremendous assets in this process. They are adept with program development, proposal writing, budget development, logic models and much more. I highly recommend Diane and DH Leonard Consulting and am grateful to have had the opportunity to work with them." "Diane, and her team at DH Leonard Consulting & Grant Writing Services, are true specialists in helping organizations further their mission. Besides their critical research skills in finding the right grant to match the organization's mission, they achieve a substantial grant acquisition rate, in large part, due to their grant readiness strategy! If your organization is serious about securing grants, DH Leonard Consulting & Grant Writing Services is a must have." "Thanks to Diane's guidance and expertise as a consultant to Save The River over the past few years, the organization significantly increased the number of grants received in support of our programs. From providing valuable strategic advice for our annual planning to handling the nitty gritty of application details, Diane was a positive and knowledgeable partner as we pursued our goals of increasing annual grant funding. She has a strong ability to quickly grasp and articulate in writing the details of an organization's vision and programs and an eye for matching potential grant opportunities with the organization's program needs. Diane is also very organized and clear in her expectations for each project she pursues. Diane consistently went above and beyond my expectations each time I worked with her. I highly recommend her services"
"It is my great pleasure to serve as a reference for the DH Leonard Consulting & Grant Writing Services, LLC and to enthusiastically recommend the company's outstanding expertise with editing and grant writing services. In all respects, including knowledge, expertise in guiding the grant writing process from an early phase to completion, integrity, and commitment to her client's success, I can highly recommend the company to you - and am confident the staff, led by Diane H. Leonard, GPC will be an ideal partner in the collaborative process of grant writing"